Playing in a band is one of the most rewarding and fun musical experiences! The collaboration between fellow musicians does not only give students a whole new meaning to playing music, but also very often elevates students’ playing to a much higher ground. In this 10-session program, students with similar ability, interests and age will form a band that meets every other Saturday for 90 minutes. The band will be made up of a drummer, a bassist, two guitarists, a keyboardist and a vocalist. An instructor, besides taking up one of the instrument spots, will be coaching the class. 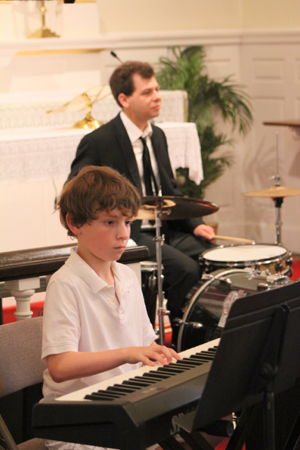 Unlike any band programs from regular schools, our students will be choosing the music that they want to play. Moreover, with a focus on their individual strengths, music will be carefully arranged so that individual members will be highlighted in the group. On top of these, based on students’ experiences on their instruments, students would explore improvisation and writing original music under the direction of the instructor. Upon completion of the program, the band will showcase their work at one of our public recitals. This is truly a unique and invaluable opportunity that completes the experience of music education for every student! 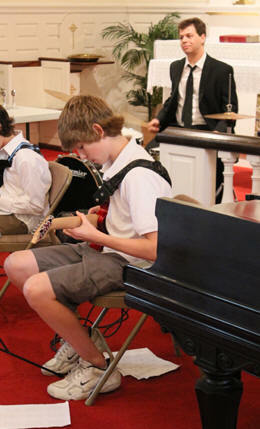 Rock Band Class is for students 10 and up with at least 1-2 years of formal lessons on their instruments. Prior to signup, program director will schedule free assessment meetings with interested students to make sure they are ready for the class. Please contact us for more information. Rock Band Classes are available during Fall and Spring semesters. Each class will meet for 10 90-min sessions every other Saturday (starting in September for the Fall and February for the Spring).